KARACHI: In a first, the Pakistan Tehreek-e-Insaf (PTI) government has decided to open the gates of Sindh Governor House to the public on September 16. According to the decision, the people will not only be able allowed to walk in the spacious garden of the official residence of Sindh governor but also permitted to enter into the historic building. Responding to a question, the governor said that after taking charge of his position, he has been using only two rooms of the official residence and only one government vehicle. “I have rejected the protocol of previous governors which included 40 cars,” he added. The Sindh governor said that the public would be allowed to enter the premises from Gate 1 after the formal identification. The main building of the residence comprises offices of governor, advisers, principal secretary, military secretary, ADC, comptroller, and private secretary. Other offices and dispensary are also located in the governor house premises in separate office blocks. The building contains three wings. The suite occupied by Quaid-e-Azam and Mohtarma Fatima Jinnah is called Royal Suite, which is used by visiting heads of state, government officials and other VVIPs. The Darbar Hall often appears in the national press and electronic media where oath taking ceremonies are held. Darbar Hall contains a historic throne which was specifically made for King Edward VII during his tour of India as Prince of Wales in 1876 and was also used by Her Majesty Queen Mary during the coronation Darbar of King-Emperor George the Vth at Delhi in 1911. Tall trees and lush green lawns surround the building. Some of the delightful sights in the governor house include: Rose Garden and Chahar Bagh. An orchard is laid out along the Westside and a row of gold mohars (emblem tree of Karachi) are planted along the entrance. The orchard contains a botanical garden in which two varieties each of well-known plants and flowers of Sindh have been planted. A rose garden has also been planted containing 36 kinds of roses, which provides fresh flowers at no cost to the Governor House. A walkway has been constructed for security purposes to protect the house from the mushroom growth of high rise buildings. In keeping with the traditional concept of Islamic Gardens of Paradise, Chahar Bagh has been laid out replicating with four squares garden at the entrance of Jahangir’s Tomb. The Chabutra, the site of the swearing-in ceremony of Quaid-e-Azam Muhammad Ali Jinnah as the first Governor General of Pakistan, has been paved with a geometrical design in stone. 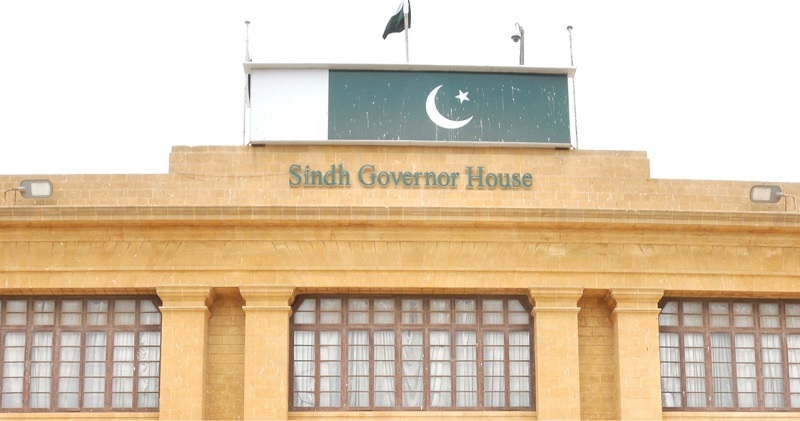 Built first in 1843 by Sir Charles Napier when the British annexed Sindh, the name of the present governor house has been changed many times. The rank and status of one that came to live or work in it necessitated it. During the period of stay of the Quaid-e-Azam, it was known as the Governor General’s house and continued to be called so till 26 March 1956, when Governor General Iskandar Mirza was elected first President of the Islamic Republic of Pakistan. The House thereafter began to be called President’s House. After July 1970, the name was changed to Governor’s House once One Unit was dissolved and the Provinces revived. The House contains portraits of the governor generals, presidents who lived here or served as the governors of Sindh. Following the win in the recent general election, the PTI government announced to exercise austerity measures to curb excessive expenditures and promised to end the VIP culture of the government functionaries. The party’s nominated governor in Sindh and Punjab, Ismail and Chaudhry Sarwar respectively, have announced not to live in the official residence and promised to use the minimum resources for themselves from the government expenditure. Prime Minister Imran Khan, after taking the oath, did not shift to the PM House but rather chose to settle in the Military Secretary’s residence. However, he uses the PM Office for meeting foreign and local dignitaries and delegations.